AT&S has various special processes, materials and technologies that are optimized for specific requirements like high-density wiring, enhanced thermal performance or high frequency (HF). Yet many customers’ designs often only require these high-performance but more expensive technologies in small areas of the PCB. So it makes sense to combine low-cost standard boards with the relevant higher-priced, high-end technologies – but only where they are needed. AT&S meets these requirements with its X-in-Board concept. 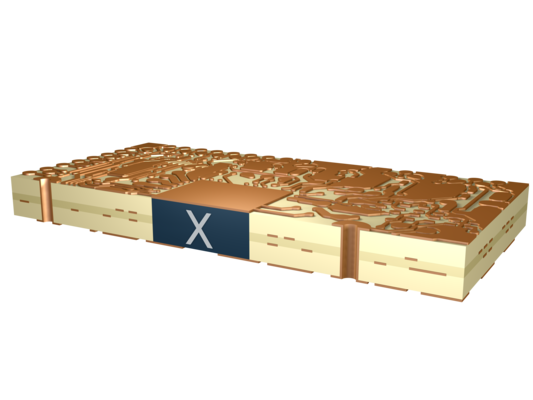 X-in-Board enables a combination of different technologies and materials within any common PCB, such as a standard FR4 board or multi-layers with vias (connections between layers) and PTHs (plated through holes). The principle is that the main board is combined with a high-performance inlay, e.g. to optimize heat dissipation, HF characteristics or wiring density. As a result, in applications such as servers or notebooks, elements with high-density wiring (multi-layer inlays) can be partially integrated directly into the overall structure, so the customer can reduce the overall PCB thickness.